Religion, faith and spirituality will always be a controversial topic. We try to bring to our site an objective and balanced view of all belief systems. This page deals with the Druidic tradition of Northern Europe andong with a taste of what to look for should you travel to these areas. A very brief introduction to the Druidic Tradition. When speaking or writing on this subject I usually start by dispelling people's misgivings. I have never dismembered virgins with a Golden Sickle or crammed people into a giant wicker man to be burned on Beltane. These things are pure Hollywood. Though I would not describe myself as a Druid I have studied the beliefs of the Celts of Western Europe and find many parallels with early Christianity, Hinduism and Zoroastrianism which was the parent of the Abrahamic religions. Nothing in Druidism is incompatible with Christianity, indeed there is a legend that when the first Christian missionaries were sent from Rome to Britain in the fourth century AD they found a more pure form of Christianity being practiced in these island by followers of the native religion. But more of that later. If you are a Christian but have entertained doubt about the way in which the modern practice seems at odds with the original message, or are uneasy about getting involved with something you know your priest would disapprove of let's establish the relationship of Christianity and Druidism first. You will find most pagan belief systems very similar as they appear to spring from the same source. Christianity too came from that source but in the progression through old testament zionism drifted further away from its beginnings. The Celtic Church, a very community based form of the Christian faith was came into being when Druids decided their future lay within the new official religion of the failing Roman Empire. The new religion had been adopted by the Emperor Constantine the Great as the official church of the Empire and Druids found it expedient to embrace Christianity, particularly as so many of its original teachings were close to their own philosophy. In the areas where their influence was already strong it was a simple matter to mould the gospel to fit their own beliefs. Christianity was the faith of the poor; had not the saviour himself said that it was easier for a Camel to pass through the eye of a needle than for a rich man to enter the kingdom of heaven. No matter how rich folks and the preachers they patronised tried to twist this, Christianity held all equal in the eyes of God and it was not what you had but how you got it that would be judged and the emphasis was on good heartedness and charity, in its truest meaning "love of one's fellows". The keystone of the Druidic faith was the commitment to community. The King, the elders and warriors, priest, bards and healers had all, on being elevated committed themselves to serve their communities. So the early form of Christianity, unadulterated by church and Imperial politics was pretty much in line with what the Druids had taught, apart from the fact that Christians were loyal to Rome while the Druids were fanatical about the superiority of all things British. 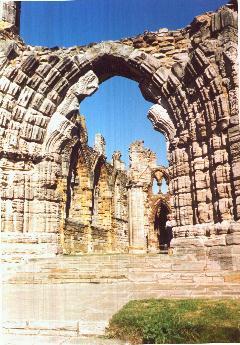 The interior of the last Abbey Church of Whitby. 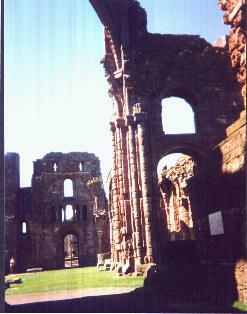 The Abbey community was dissolved by Henry VIII in the 16th century. From where the Altar stone stood we get an idea of the scale. The detail still visible on stonework crafted in the 12th century and exposed to the elements for 500 years is a tribute to the masons. Look around these Abbeys though, particularly Durham Cathedral a few miles to the north of here and it is easy to find some very unchristian symbols carved on the stones. Historians tend to read history backwards, looking from where we are now in order to make sense of what happened 1600 years ago. To truly understand however we must try to place ourselves within the mind of a newly converted Druid whose aim was to protect the beliefs he or she had cherished What better way than to connect the new faith with the old. Among the many legends surrounding King Arthur and the Holy Grail there is one that stands out because it offers many insights. There is a view gaining ground among students of pre - history that most of the ancient belief systems sprang from a single source, some mysterious lost civilisation that flourished before Noah's flood. The evidence for this is provided by the many parallels between religions and mythologies. One that concerns us here is the story of a vessel that contains the key to all wisdom. The earliest appearance of the legend is in the Hindu Rig Veda, a holy "book" preserved since time immemorial through an oral tradition maintained in monastic communities in northern India. What this vessel was is open to interpretation, a cup, bowl, gourd, chalice, cauldron, Grail, ark - or perhaps something less tangible, the eternal spark of divinity that holds within it the essence of all life, the Ashless Fire? In modern terms one might describe the Church of Rome as Episcopalian while the Celtic Church was Presbyterian. To the Celtic Britons the Church was the centre of their community and the priests, monks and laity were very much servants of the people. The early Church of Rome on the other hand was a political tool, at first promoting loyalty to the Empire, later reinventing itself as a religious replica of that Empire with the Pope as Emperor or figurehead and the priesthood fulfilling the role vacated by the Imperial bureaucracy. The Roman Empire had always been secular and very tolerant of local religions; so long as people paid their taxes and obeyed civil law they could worship whom they liked. The new Empire - not until later was it actually called The Holy Roman Empire - had to assert its authority and having no armies to speak of its chief weapon in controlling the population was fear (remember that Monty Python sketch "our chief weapon is fear and surprise - our TWO chief weapons...."?) whereas the Druid philosophy was one of community of interest. Equality was not high on the agenda of the early Popes, the church was the supreme authority in all things and officers of the Vatican set to suppressing the Druids. The Celts are a very hot blooded and impulsive people and do not take kindly to being told what they can and cannot do. The Celtic Church did well in Britain, spreading to Ireland and to the Brittany region of France. It was becoming a threat to the ascendancy of Rome. 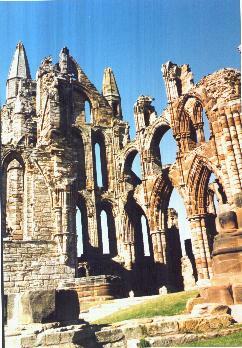 The Synod of Whitby in 645 AD was a political manoeuvre which promised the Celtic Church certain freedoms in return for accepting the Pope as its head. Political promises are easily broken and the new leaders of the Roman Church in Britain set about purging the Pagan and Druidic influences and the reputation Druids have endured for most of the last thousand years was really nothing more than negative propaganda manufactured by early Christian spin doctors. Strangely the Druidic influence in Christianity survived best where it was closest to the hear of the Catholic Church, in the monastic orders. There are a number of mysteries surrounding Jesus of Nazareth, the most interesting being the lost years between the boy's bar mitzvah at the time of puberty and his sudden reappearance as a mature man ready to begin his mission in Galilee. Do you remember being taught in school of the boy Jesus debating questions of faith with the elders in the temple at Jerusalem? Maybe that story is omitted from your Bible, because of certain revelations in the Dead Sea Scrolls it raises a number of interesting questions about that period of Jesus' life. According to the Bible, Joseph his father was not a young man at the time of the nativity and so it seems likely that Mary was widowed at an early age and with a growing boy to support. Here the mysterious figure of Joseph of Arimathea steps in. This man was allegedly a member of the Essene, a Hindu or Zoroastrian sect that was active in the region and fragments of the Dead Sea Scrolls deciphered from Aramaic dialect in the 1960s suggest this Uncle may have taken Jesus, or Yeshu (Joshua), under his wing and placed him with an Essene community to be educated. The Albionised version was that Joseph of A was a Druid and brought his nephew to Glastonbury in South West England, the greatest centre of Druidic learning. As with many legends there seems to be a little truth in it because the Druids and the Essene held a very similar set of beliefs on ethics and spirituality and we certainly know that the Druids had contact with the middle east and the Indian sub - continent. Celtic and Hindu sacred symbols are practically identical. It makes some sense of that poem and Hymn by William Blake "and did those feet in ancient times/walk upon England's pastures green? OK, so what was Jesus the student doing at Glastonbury - well the world famous rock festival was not held in those days but even so it was a happening place. Miracles, strange lights in the sky and other mysteries regularly manifested and the summit of Glastonbury Tor, a hill thought to be at least partially man made, is the centre of a huge network of ley lines. In the learning centre students or acolytes would have learned astronomy, the healing arts, other esoteric skills, meditation techniques and the history and tradition of their sect which was considered too precious to ever be committed to writing and had to be memorised. They would have also been trained in music, poetry and in the business of plant and animal husbandry for they were to be secular as well as spiritual guides to the people they would serve. 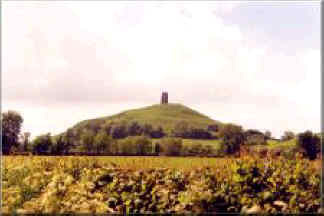 The legend is completed when the story continues that Joseph of A returned to Glastonbury after the crucifixion, buried the Grail in the grounds of the Druid college and planted his blackthorn staff to mark the spot. The Druid college where many of King Arthur's followers were sent for instruction before being admitted into the fellowship of the Round Table (they attended the Knight School.....) was like so many other sites the Druidic centre was was later taken over by Christians and the blackthorn tree that grows now in the grounds of Glastonbury Abbey is said to be the one planted by Christ's uncle 2000 years ago. These stories are fun but should not be taken too literally. Much more likely is that the Druids somehow had contact with other learned sects in distant places with whom they shared an ideology of community of interest, reverence for wisdom and learning and a commitment on the part of the gifted or "chosen" (remember here that "christ" is derived from a Greek word meaning "chosen one." Druids believed as did the eastern sects of Hinduism, Zoroastrianism and Buddhism, that the greatest spiritual reward would go to those who humbly served their fellow men and worked to advance the common good rather than their own interests. You might think that this is entirely compatible with the central messages of Jesus of Nazareth' teaching and not very compatible at all with much of modern Christianity. I'm sure most Druids, Essene and whatever would not condemn such a thought as uncharitable. We know for certain no more about Jesus, the Christ or Messiah than we do about Arthur, chosen one of the British Celts. I am sure both stories are equally romasnticised and sentimentalised. What I do know about both stories though is that the truth has been suppressed and often destroyed for political reasons. The Christian faith we know today owes mush more to St. Paul (Saul the Zionist agitator) and to another extremist, John Calvin the Swiss evangelist than it does to Jesus himself. But I will give you this, from the Gospel of St Thomas, "split a piece of wood or lift a stone and you will find me, do not look for me in temples and great houses." Make a mental note of this until you read the definition of The Awen further down this document. The Gospel of St. Thomas is written on a parchment scroll found in a cave near the Dead Sea in 1945. When dechiphered its contents were locked away in the Vatican. A few scholars who have seen the translation report it to be to be the words spoken by Jesus to the disciples at the last supper. What could these words contain that make them so dangerous to the established religions? The truth perhaps? Learn more about Glastonbury and its many legends and mysteries. Distant View of Glastonbury Tor. 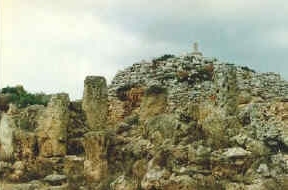 The Tower at its summit is the last relic of a Christian Church built there in 495 AD. Thought rebuilt many times it was finally destroyed by an earthquake in 1245. A pathway spirals around the hill to the tower suggesting the summit was involved in some kind of religious ceremony that involved a procession. Water was as important as fire in the ancient tradition and nowhere is Britain is far from an ancient well (sometimes called a fountain or spring) that is said to have healing properties. These are usually given the name of a local saint, (Celtic saints were ten - a - penny) but the legends surrounding them are invariable pre - Christian in origin. 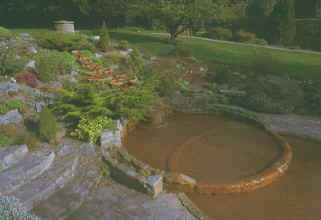 The Chalice Well at Glastonbury is said to be in the place where Joseph of A buried the Grail or Chalice. The water that miraculously sprang from the earth after he did so had the power to heal all ills. Unfortunately for the Christians whose persistence in trying to debunk the pagan seems indefatigable, modern archaeology shows that the well and traces a group of hermits dwellings around it are pre Christian. So Who Were The Celts? 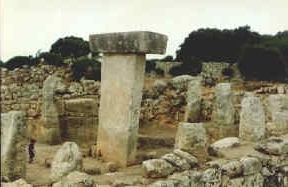 A small stone circle in the centre of a neolithic village on the Balieric island of Menorca. The keystone and its sarsen are modern replicas copied from fragments found in the excavation. At the eastern end of the village stands this pyramid of loose stones and earth. Its proportions are in relation to the pyramids of Giza and the Valley of the Kings in Egypt, pyramid shaped earthworks in the UK, Western France, mainland Spain and Scandinavia and stone pyramids of great antiquity in both South America and South East Asia. So what it the big thing about pyramids for the ancients? Could the fact that they are a solid shape relating to a sphere be significant. Enlarge them to earth size and they would fit a hemisphere, the apex touching the pole and the corners the four cardinal points of the equator. Another view of the pyramid from the circle. Most of the upper layers of stone had been removed over the ages by pragmatic peasants. Note the modern stone on what is now the summit, which is aligned with the keystone of the circle and a celestial constellation. I can't remember which. When I took the photographs I never envisaged writing this article and did not make notes. As I said above Druidism is not truly a religion but a tradition of living in harmony with nature and our world and so it can and has absorbed elements of, and been absorbed by many local systems of worship. We do not have much recorded history to tell us about the Celtic civilisation in Britain before the coming of the Anglo - Saxons, let alone what was going on before the Roman Conquest and most of what passes for fact is very speculative. Furthermore that which suggests the Celts were not a bunch of baby - eating barbarians but actually quite an advanced civilisation is rather inconvenient to the Christian hegemony and has therefore been suppressed or systematically debunked in a very intolerant and unchristian manner. We do know for a fact that the origins of the Celtic people are in North West India and South West Pakistan and many traditions connect them with the Sumerians whose civilisation, allegedly the oldest known, flourished around the Persian Gulf around four to seven thousand years before present. WARNING; Here is where we part company with the creationists. Because of the Biblical overlay on all research in this region the true age of relics of the Sumerian civilisation, the cities of Ur of the Chaldees, Babylon and Nineveh is clouded in mystery. New threads of discovery however suggest they are somewhat older than acknowledged and that far from being the parent of the Indus Valley civilisation Sumeria was in fact its offspring. Note to Creationists; the author accepts the feasibility of the universe having come into being as the result of a creative act but even so it seems highly unlikely that the force or entity capable of such an act would measure time according to the revolving of our insignificant planet around its insignificant sun, one of 100 billion stars in our galaxy alone and even if that were the case such a being would not use the Gregorian Calendar which has only existed for about a thousand earth years. Jesus himself would have used the Hebrew reckoning of time which makes nonsense of the Creationist timescale. At some stage a combination of momentous events caused the Celts to begin a great migration to the West which took them right through the biblical lands, through Asia Minor, across Europe and eventually to the British isles, and the western fringes of Europe. There are so many parallels between Celtic beliefs and traditions and the Native American belief systems one is tempted to wonder if a similar eastward migration began simultaneously. Any reader wishing to learn more of such theories might enjoy reading a book called Underworld by Graham Hancock. Hancock suggests that the cataclysmic event might have been Noah's flood. There were several global floods caused by the effects of the receding ice caps after the peaking of the last ice age around 25000 years ago. As the Celts moved westwards there was always cultural exchange with indigenous tribes. Druidic influences are found in the ruins of Tyre and Sidon, the cities of the Phonecians and at Troy. The mythology of the ancient Greeks has many parallels with the stories and legends of the Druidic oral tradition. 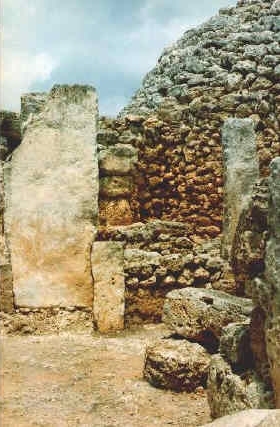 Sacred symbols occur again and again, in Neolithic relics like those pictured above in the Balieric Islands off the coast of Spain, in the Menhirs of Western France and in the great stone circles of the British Isles. But......and its a big BUT......the stone circles were here before the first Celts arrived. One myth that needs to be dispelled is that of the stone circles. Stonehange and the much less sophisticated Avebury, Brogdar and Callanish in the Scottish islands and all the other standing stones around Europe were actually erected by an earlier people. We do not know enough of these people to even speculate what their motivation might have been, it is known however that the keystones of the inner circle at Stonehenge were brought from the Preseli mountains in South Wales, over a hundred miles away by land. A recent speculative attempt to prove that the ancient people rolled the great stones on logs to the nearest shore and transported them across the Bristol Channel in giant coracles before rolling them inland to the site of the henge failed dismally, despite the benefit of modern roads a huge team of volunteers did not even manage to move similar sized stones quarried in the same mountains halfway to the proposed embarcation point. We think of the so called Beaker People who inhabited Britain from the end of the last Ice Age about 25000 years ago, through the Neolithic period and the Bronze Age as primitive savages yet the scant evidence of their way of life points to a sophisticated culture with a legal system, organised commerce and a marine technology capable of building ships that could travel to trade with Spain, France and the low countries. Is it coincidence that their belief system dovetailed so neatly with that of the Druids that it provided properly aligned stone circles that would act as astral observatories for calculating the occurrence of, eclipses and the precession of equinoxes? The phenomenon of equinoctal precession was only re-discovered in the 20th century. What is precession? Well think back to when you were a child and played with a spinning top. As it spun on its axis in one direction it would develop a wobble in the other direction. The Earth, spinning on its axis in space, does the same and this means that sunrise on the morning of spring (vernal) equinox will gradually progress through the signs of the zodiac in reverse order. The full cycle of the "Great Year" as the ancients called it takes about 26000 years, the time spent in each sign of the zodiac being referred to as an "age". We have just entered an age. "This is the dawning of the age of Aquarius", remember that song. Well we are in the age of Aquarius now. "So what about the harmony and understanding?" you may well ask. Traditionally the transition from one age to another is a period of turmoil and change. With each age lasting around 2,200 years we cannot expect the transition to be over in as few days. Anyway the Druids knew about precession as did the Ancient Egyptians and The Sumerians. The Abrahamic religions spurned such knowledge in favour of building strongly patriarchal cultures based on the omnipotence of a bad tempered male God who permits no questioning of his authority. Obviously to create such an awe inspiring figure and then to claim that one's authority is handed down from him is a potent tool for social control. Much fascinating information about the earliest civilisations of humanity were deliberately destroyed in order to justify the control freak tendencies of middle aged men. Perversely, given the image projected by Islamic fundamentalists now, we have the Islamic world and a few semi-secret societies such as the freemasons and the Theosophists to thank for most of what is left to us. Weird Science Few people will have heard of the science of Radiesthesia. A more simple title "sonics" gives a clue to its nature. Our earliest encounters with radiesthesia come from ancient Egypt and the hieroglyphic writings found in catacombs at various places in the Nile valley although there are signs the knowledge was used elsewhere, notably in India and Thailand, Mesopotamia, the British Isles and South America. Radiesthesia is the study of the energy of sound and shape. Did you know that if a dull razor blade is left in the great pyramid of Cheops (or a correctly aligned replica) it will after a few hours be restored to sharpness. Were the pyramids and the earthworks some kind of bronze age molecular engine? The techniques involved in harnessing the energies emitted by certain shapes and sounds are thought to have been developed in Egypt at the time of the First Kingdom. Somehow these ancients, allegedly only a few decades away from a stone based technology according to the accepted thinking of pre-historians were able to cut huge slabs of brittle stone and mill the surfaces to finer tolerances than can be achieved by modern technology. Some of the stone slabs in the Pyramids weigh up to a hundred tons and yet are so finely finished and fitted that after all this time it is not possible to slide a credit card between them. A similar quality of workmanship is found in the ziggaurats or step pyramids of Mesopotamia at Ur and Nineveh, around South East Asia, in recently discovered submarine ruins off the coast of India and in Mexico and South America. On top of that impossibility there is the question of the distances these stone would have had to be moved from where they were quarried. Expeditions in the 1990s, like the one connected with Stonehenge, to move Pyramid ready stones from the quarries to the Nile on wooden rollers and thence to Giza on reed rafts failed dismally. These expeditions were supported by academic traditionalists and fundamentalist Christian organisations in order to debunk the "new age" theories that were gaining ground. In the end they only left more questions. The most credible theory and one in which some experiments have been successfully carried out in various well respected universities in the western world is that the great stones and other heavy objects were moves by means of sonics. Radiesthesia has many applications beyond harnessing energies within geometric shapes. Similar energies are said to be transmittable through sound vibrations. One of the uses of sound favoured by the Druids was in healing, particularly sickness "of the spirit" (mental illness.) Have you ever heard any of those Celtic melodies favoured by some Irish and Scottish musicians, Clannad, Enya, Cara Dillon, The Fureys to name but a few, or the world famous songs like Danny Boy, Wild Mountain Thyme, The Green Fields of France (aka Streets of Laredo), The Minstrel Boy. Melancholy and haunting sounds certainly and yet many people find them very uplifting. (If you are not familiar with any go to the opening page of each part in An Ashless Fire and listen to the midi files. Or visit this folk music site and search out Irish Scottish or Welsh tunes. (If like me you are not a lover of midi music which can easily sound as if it is being played by a kindergarten glockenspiel band try a few Cara Dillon tracks. This girl really has the most beautiful voice.) Similarly with eastern music, often atonal to western ears attuned to the chromatic scale but again capable of touching us at a deeper level. Modern researcher into this branch of Radiesthesia call it "microvibrational physics." It is thought that all solid objects have a critical frequency at which the vibrations set off within the atoms reverse the effects of gravity, rendering huge objects weightless. I have strayed way off Druidism here so I will leave you to your own research now. If the Druids knew of this eastern science and of the theories of mathematical mysticism developed by the Greek philosophers such as Pythagoras (but actually before the time of Pythagoras) where did this knowledge come from? Almost every mythology has a legend of a group of demigods who came from the sea and brought gifts of civilisation to give order to primitive cultures. These gifts were law, healing, science, music, poetry and spiritual understanding. To the Olmec of South America they were the Virococha, the Tuatha de Danaans to the British Celts, The Seven Sages in Hindu legends, the Nephilim to the Hebrews, they were the heroes of ancient Greece and also Nordic legend. They were in all instances the offspring of a mating between primitive humans and divine creatures. Take these quotations from Genesis 6 verses 1 and 4. Verse (1) "Now it came to pass when men began to multiply on the face of the earth and daughters were born to them that the sons of God saw the daughters of men that they were beautiful and they took wives to themselves of all whom they chose," and skipping to verse (4) "There were giants on earth in those days and afterwards when the sons of God came in to the daughters of men and they bore children to them. Those were the nephilim who were the heroes and men of renown. Puzzling isn't it? Sadly there are no easy answers. The source of this knowledge is concealed in pre - history and unless some remarkable finds are made by archaeologists we are unlikely ever to know the truth. A great deal was lost when the library of Alexandria was destroyed by a mysterious fire during the Roman era. The Dead sea scrolls, discovered in Jordan between 1945 and the 1960s are said to contain much information by possession of these was taken by the Vatican, their content was describes as heresy and they have been locked away ever since. But why not publish and let the world judge, unless of course there is something to hide? In the novel An Ashless Fire I have written in a fictional context of the Celtic way of life and the commitment of Kings and Warriors to their community. To serve the common good was seen as a sacred duty, the gifted were not given their talents simply so that they could make themselves more rich or powerful. (In the context this is obviously a reference to modern corporate imperialism.) A merchant or farmer who gave himself the best while treating his workers and tenants badly would soon find himself shunned in the community. It was accepted of course that Kings and noblemen should be materially better off but with their rank went a responsibility to ensure that the needy were provided for. There were laws of hospitality too, it was a taboo to turn away a traveller seeking food or shelter and to not offer help to a sick or distressed person would incur the wrath of powers both secular and supernatural. Three was a sacred number to the Druids, (the threefold woman, the three rays of the Ovi) and any unkind or inhospitable behavior would come back threefold. Also failure to care for the old, neglect of children, cruelty of any kind and failing to respect another's property were crimes. 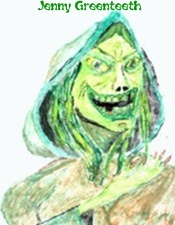 Wrongdoers would be tried by a jury of Druids and elders and could be stripped of rank, ordered to pay forfeits or make reparation by service. Punishments usually involved humiliation so nobody was allowed to forget they were part of a greater community, not even the King. It should surprise nobody that many of these laws are continued in theory at least in the Magna Carta, the Bill of Settlement that Established the superiority of the British Parliament over the monarch in the 17th century and in the Constitution of the United States of America. 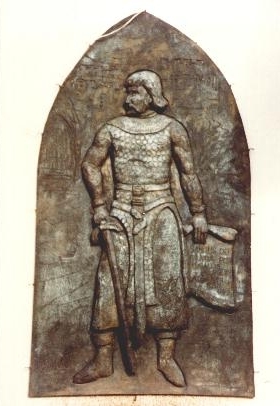 A Celtic tradition that carried forward into the Saxon era and continued in principle beyond it was that the King ruled by consent of his people. The Celtic Overking or Vortigern was elected or acclaimed sometimes, as was the case in the Arthurian legend of the sword in the stone, by other Kings after some great task had been accomplished. Each lesser King would be chosen by a council of elders among his tribe. There is a dichotomy in the British monarchy today in that although ceremonially the present Queen is said to be the anointed of God and rule by divine right, since the overthrow of the Stuart dynasty in the 17th century the Monarch had only held the office by consent Parliament's House of Commons, the elected representatives of the people. When King Henry VIII challenged the power of Rome he appointed himself as spiritual head of the English church, but his secular political role was by the consent of Parliament. After the death of his daughter Elizabeth 1, the dastardly Stuarts in collaboration with the "Papist French" tried to declare themselves absolute rulers answerable only to God (via the Pope, then seen as the embodiment of God on Earth) It led to over a century of religious war before William of Orange was proclaimed King with some very severe constraints on his powers. Ironically he numbered among his supporters the Calvinists who would have liked to impose God as an absolute ruler of the secular state and would not be convinced of the folly of this position. Many of them emigrated to America when they did not get their own way. From the Celtic tradition of humility and service grew the age of chivalry, the strong did not throw their weight about but were required to behave with courtesy, restraint and consideration. This code of honour was written in the legends of Arthur and his Knights of the Round Table, but it originated from the warrior code of the Celts. Modern feminists may think it patronising now but in the medieval world where, in spite of what I have said about moral values, there were many who lived outside the law and were truly little better than savages, it even the most strident feminist would have been glad to have a knight or warrior committed by his honour to offer her protection as a travelling companion. The whole Celtic social system worked by consent, by willingness to accept and respect the rights of others and the Druids could be very hard on anybody who strayed beyond the bounds of decency. Wrongs could be avenged but only within strict boundaries and once redress had been granted forgiveness was obligatory. We tend to define civilisation by material parameters alone. The Romans had hot baths, running water (although delivering it in lead pipes sent them all mad in the end) good roads, magnificent buildings and they recorded their acts in a written language. So they must have been civilised. For all their grandiose posturing though, the Romans craftsmen never matched the skill of Celtic artisans in many fields, particularly that of metalworking. Among the Celts the role of Druids was not as priests, maintaining the spiritual power of a barbaric religion but wise teachers, healers and artists. There were three ranks of Druidism; Bards, the poets and artists; Druids who were teachers and philosophers and Ovates, the healers; it was the function of certain Bards to commit to memory the entire history of the people, the histories and myths, the genaeology of families stories of the acts of Kings and warriors. They would devote their entire lives to this task. The Druids themselves were great scholars, mathematically they were more sophisticated than the Romans and the geometry used in their astronomical calculations shows that theories credited to Pythagoras were in fact in use long before his lifetime. Then there were the craftsmen, particularly smiths whose affinity with the metals they worked was almost mystical, and the warriors, bound by their code of honour and prepared to give their lives to defend the security of their community. Modern medicine has concentrated on the use of manufactured pharmecuticals and only now is mainstream medicine catching up with natural therapies known to the Ovates. The social system presided over by the Druids and the Kings and Queens they advised required all people to show generosity of spirit, hospitality to travellers, to care for the old and sick within the community, to take communal responsibility for the young and to share the tasks of providing food and shelter. So how uncilvilised would you say the Celts were now? What makes a civilisation, material wealth or wisdom and tolerance? The pre-christian people knew the therapeutic value of relaxation and regular partying. While the learned Druids studied the movements of the heavens the bards played a great role in the celebrations of the Eightfold year, a series of feasts and celebrations that coincide roughly with the major Christian festivals and that mark the progress from one stage in the cycle to another. This is no accident, the Christian leaders moved their festivals in order to retain the appeal of the natural cycle. To the Druids everything went in cycles, the seasons followed each other inexorably as years passed and so the generations of man lived their eternal cycle. Summer/ Flowering and pollination of plants to begin making of the next cycle's seeds, in humans the taking of partners and conception of children. Autumn or Fall/ Maturity, next years seeds are swelling on stem and branch but the leaves are turning, the mother and father are at the height of their powers but their hair is greying, the bloom fading from their skin. Winter, decrepitude and eventual death. But as the plants dies they let fall the seeds of the next generation, as the woman and man face their own mortality the see grandchildren growing, preparing to carry forward the family. If we consider Winter as the period between death and rebirth this cycle can be equated to Shakespeare's Seven Ages of Man. The recognition of this fundamental but mysterious connection between the source of our individual lives and the source of the life of the planet links these eight particular times during the yearly cycle which are have a special significance and which are marked ceremonies and celebrations. Taking the winter solstice as marking the passing from the end of one year to the beginning of another and marking the time of death, the first festival is Imbolc, February 2nd, dedicated to the goddess of fertility and of water Brigid or Brigantia, it is the time of the breaking bud, when the first shoots begin to appear on branch and green shoots start to break through the soil. 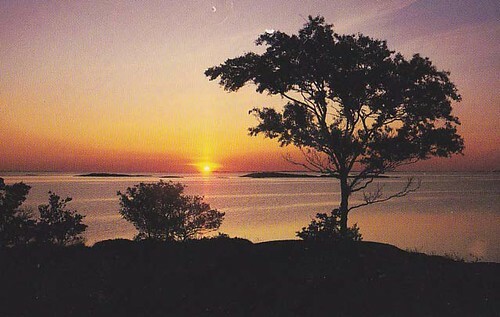 The next celebration is the spring equinox signalling the time of flowering, the main fertility rite. The sun is growing in power, after this the hours of daylight outdo the hours of darkness and the fields are sown, the seeds germinating in the earth. People who depend on the natural cycle for their livelihood ask the gods for a good harvest and look forward to the warm, comfortable days of summer. The Equinox is followed by Beltain, dedicated to the god Beli and special to herdsmen and livestock farmers. It is the mating season for many farm animals. Weather in the weeks following Beltain affected the progress of pregnant animals, a good growing season and the cattle, horses, goats and sheep would bear strong healthy offspring that had a good chance of surviving the rigours of their first winter. A Beltane tradition in many parts is the lighting of fires, ancient tradition has it that herds were driven through a fire in a symbolic purification. We have disinfectant now of course. After Beltain was the summer solstice, a celebration of life itself. The Sun is revered at the height of its power, it has resurrected from the cold dark days of Winter and rules the skies, ripening the crops growing the grasses and herbs to fatten grazing animals and preserving the cycle of life for humankind for another year. It is often taught that the ancients worshipped the Sun as God but this is not quite right. In every belief system the sun relates to the father figure which throws its benign heat on the proceedings while the million tasks at the business end of the cycle are being taken care of by the Earth mother. Does this relate to the human cycle? Ask any woman. In early August as the days became visibly shorter and summer shows the first signs of fading comes Lammas or Lughnasa (I stick with Lammas, its easier). The main growing season of crops was over and it was the time of ripening and preparation for the harvest. It also represented a lull in the frenetic activity of tending herds and crops, the fields could be left to themselves as the crops were well established and the young animals were growing and gaining strength. A good time to unravel and take a holiday. The Autumnal equinox is the day on which, though light and darkness are of equal length we are aware that the power of the sun is weakening, the cycle of the year is approaching death and we are reminded as we give thanks for the harvest and the food which will sustain life through the dark days that we all must one day face physical death. But in death there is new life and from the harvest we take the seeds that will grow into next years crops. About six weeks after the equinox is Samuhinn, originally between October 29th and November 2nd but now as Hallowe'en reduced to Ocober 31st and Noveember 1st. This is the time of no time, the days on the year. Druids were sophisticated enough to know that originally the Earth's orbit around the sun had been completed in 360 days or revolutions on its axis something (they do not tell us what) had added five days to that orbit and made it slightly elliptical. In legend these days are the time when the gods were born. The Celtic society like all civilised races lived in ordered communities and in our time we are better placed than any of our ancestors to know that within order lies the source of stress. People have to let their hair down, cut loose, break the rules, kick out against authority. The Celts, like the Greeks, Romans, Egyptians and others knew that it was beneficial to the psychological health of the community to ease the pressure and let chaos loose. Time was abolished during Samhuinn, people did crazy things, men dressed as women and women as men, The Lord of Misrule led the revelry. Many children born in the following July would look nothing like their fathers. Farmers' stock was moved to different fields, and children would play tricks on neighbours or entertain them for food and treats. Does that bit sound familiar at all? Winter Solstice was a more solemn occasion, the Sun was mourned at its death (in the far north of course the Sun did die, failing to appear above the horizon for a time) and it was a time to reflect on what had happened in the previous year and the state of one's life. But there was celebration too, for soon the sun would start to climb higher in the heavens every day and the whole cycle would be repeated. What Did The Druids Believe? An obvious question but one that is impossible to answer. The beliefs appear to have varies from area to area, from community to community. Life was sacred in all forms, as were the cycles of nature. It is often said that Druids worshipped the Oak Tree, these great and long lived trees had a special symbolic significance but "worshipped" is too strong a word. All my reading points to the idea that public ceremonies and personal ritual were more about focusing energy and balancing the life of the individual and the community with the environment. There is no actual systematic religious tradition that we can pin on the Druids. A General theme seems to have been adapted to personal needs. The most Divine entity, The Awen is similar to Brahman of the Hindu tradition and Cronos in the ancient Greek system and Jehova in Judeaism, an energy so remote and so great as to be unknowable to any human. As in Hinduism the more accessible gods represent the psychic energies that animate the human condition and the physical element in our world. There is always a Fire god, a Water god, a god of love, a god of war, a fertility god, a god of the forests, sun, moon, wind etc. Then there are the lesser gods, each tree, each stream or well, each house has its own God. All the greater and lesser gods however are simply manifestations of the Awen, the oneness that connects all things in the Universe - the multiverse I should say because the Awen is also in that which touches the physical Universe but is not of it. Beliefs about death and renewal, the eternal cycle, in relation to the human life are far too complex to get into. There are many sites on the web where Druidic spirituality is explored more fully. The Druids taught nature worship, their religion could be tailored to farmers, herdsmen, carpenters, those who worked with clay, tanners. Rather in the manner of Zen part of the worship was to give one's all to the task, to do everything as well as it was possible to do it. To a Druid it did not matter what rituals people practiced so long as they observed their obligations to the community. People who were cruel or unnecessarily violent to servants, wives or children were punished or ostracised and the importance of these traditions was shown many times in stories of the gods and heroes. Metal workers or Smiths were a rather special case. To the Celts those who worked with metal held a status almost as elevated as the Druids themselves. Iron was more precious than gold which was fine for ornaments but useless for making tools or weapons and those who knew how to turn iron into steel (the Romans you may remember never learned this skill) were thought to have been touched with divinity. While they took part in and presided over the ceremonies and celebrations of the ordinary people the Druids concerned themselves with philosophy, poetry and academic study, their personal objective being to understand the Universe and thus bring humans to The Awen. So in that way they were rather like us, think of the scholars who ponder the meaning of life, the sociologists who who seek a fairer and more efficient order for our communities, doctors who try to maintain the health of our bodies and those who concern themselves with the less tangible problems of the mind, the astrophysicists who investigate the origins of the Universe and the molecular biologists who unravel the genetic codes of DNA. And perhaps spare a thought for the poor, deranged writers and poets who delve into the realms of fantasy in our attempts to make some sense of it all. This ray is known as the Ovi and through it is explained the idea that The Awen, the greatest of all things that contains the entire Universe within it is also contained in its entirety within each physical atom, the smallest thing that can exist independently. The Ovi is the energy that flows from the Awen and connects all things in the physical universe. Try keeping this theory in mind when researching the latest advances in quantum physics. The possibilities that will open up are truly mind - blowing. 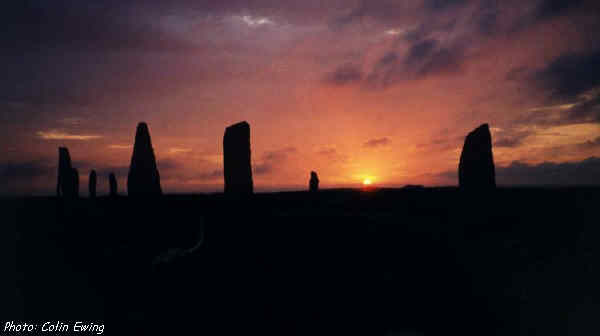 A dramatic sunset shows the Ring of Brodgar in the most spectacular way. If you like the sound of The Druid Way but are not really a person who joins chuches or gets involved with communal worship, well if you live in harmony and are not controlled by greed, lust, alcohol or other drugs, if you are not a slave to gambling or the pursuit of vicarious thrills, if you can refrain from violence and yet not give way to cowardice in the face of threats you are on the right road. This way of life is about knowing who you are and being comfortable with yourself, having self esteem and dignity, not seeking to impress others with what you do or have. Most importantly in the modern world where there are so many pressures leading us towards selfishness it is about respect for oneself and others, and for the world we live in. When you eat a steak remember an animal gave its life for your enjoyment. And if you're vegetarian and feeling smug now, remember plants have lives too, fruits nuts and grains carry the seed of a life. Everything has to eat of course the food chain exists to feed all things. We, at the top of the food chain will in time feed the smallest, lowliest forms of life. So rather than being self righteous about a lifestyle choice we should respect all the things we eat. As you bite down on that apple just think, it could be your great, great, great, great grandad. Similarly we should in material consumption respect the earth we rip the raw materials from. Are you sure you need a new computer, can't the present on be upgraded. That garment is last year's style and the designer is so not now? OK, but is it still doing a job, does it still look OK, can you wear it another season? Your car is five years old? It has lots of life in it yet, just keep it well serviced and lubricated and if somebody jeers tell yourself you are serving a higher purpose than the gathering of social kudos. If you wish to learn more of of modern Druidism use these links, tested at the time of going to press, March 2003. The myth of Altantis, the lost island continent that was the birthplace of civilization has fascinated human curiosity since the earliest times. Though the first written mention of +Atlantis occurs in Plato's dialogue Critias in which the Greek +Philosopher to refers to his ancestor Solon, one of the Seven Sages of Athens recounting the story of a lost +civilization. Indian Mosque ControversyMulticulturalism has been a disaster everywhere it has been imposed. There is more than enough evidence to clearly demonstrate that while different races can mingle so long as the culture is broadly the same, different cultures cannot easily and peacefully occupy the same geographical space. As examples we can look at the 5000 year old cultural conflict in Palestine, the 1000 year old Balkan conflicts and the tensions in India between Hindu and Muslim. MEDITATIONS The front page to our Meditations menu contains the article "Have We Forgotten How To Be" and some good advice in rediscovering the art of just being.